Well, after play testings some maps, this one was the only one I truly ended up liking. *sigh* Make some quality maps ppl! This map was boxy but does that really matter? NO heh I thought it was mighty creative, it looked to me to be a makeshift human camp that is trying to wipe out yet another spider hatchery. Comment: He did a nice job choosing the right textures and aligning them. 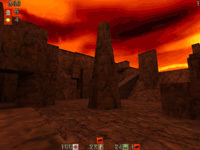 Comment: KarnagE did a very nice job on the architecture and especially on the outdoor scenes.I have never seen a more beautiful Quake2 map than this one. Comment: I've never seen anything like this. Comment: It is fun to play,and if the humans have a good engineer it is quite balanced.I have never seen the humans win on this map and i think it is quite Spider oriented. This review has been read 1873 times. The Gloom Map Depository is copyright Team GMD. Quake2 is a registered trademark of Id Software. Gloom is copyright Team Reaction. The review script is copyright R1CH.